Hola Jammers! We’ve got great news this morning… BTCjam is partnering with the leading Mexican Bitcoin exchange Volabit to bring our users from Mexico a superior Bitcoin experience. Volabit users can now transfer funds and activate automatic payments all from BTCjam.com! Lending bitcoin and gaining returns has never been easier, and Volabit users can now transfer their bitcoins to BTCjam without ever leaving the site. Together Volabit and BTCjam make borrowing and investing bitcoin in Mexico simple! 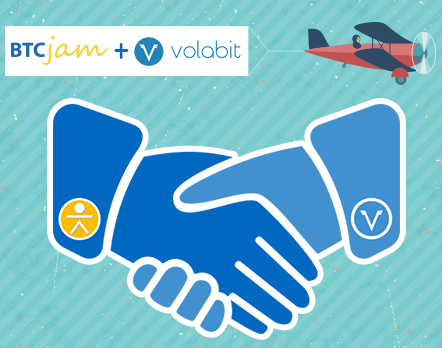 BTCjam and Volabit have partnered to make borrowing bitcoin in Mexico easier than ever. Get detailed instructions on how to connect your Volabit Wallet to BTCjam on the BTCjam Blog! Once you have connected your Volabit wallet, you can easily transfer bitcoin to BTCjam and make automatic payments on your loan. It’s just that easy. Attention Bitcoin Wallet providers, we are looking to integrate additional wallets! Please contact us at partner@btcjam.com if you would like to partner with BTCjam. About BTCjam BTCjam is the global leader in peer-to-peer lending using Bitcoin, and the first to offer a proprietary credit score to its users. BTCjam’s disruptive credit model is changing the way borrowers and investors connect, providing a new path to financial freedom for users from more than 200 countries around the world. BTCjam promotes lending without borders, where people can borrow and lend bitcoins, without having to worry about banks and other intermediaries. Transactions are instantaneous, hassle free, and supported by an engaged, trusting global community.